Climate change is the defining issue of our time. Perhaps no generation is more at risk to the impacts of this issue than those who are in school today. In a study presented to the United Nations Climate Change Conference in 2016, a survey revealed that 40% of Generation Z reported climate change as their top priority. This beat out topics like terrorism, poverty, the economy, and unemployment. All across the country, we can see examples of youth coming together and calling for action on this global problem, including students in Western Massachusetts. Last month, students from six high schools participated in a Youth Climate Summit hosted by Mass Audubon’s Arcadia Wildlife Sanctuary and the Hitchcock Center for the Environment. 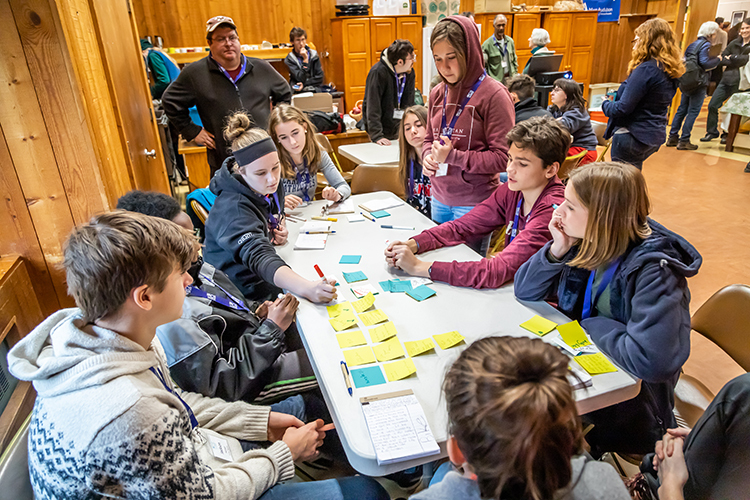 The Summit’s two days of learning sought to empower 50+ high school students, supported by 10 local college students, teachers, and workshop leaders, to take action on climate in their schools and communities. Presentations and workshops were led by environmental educators, an ecologist, a self-described “bicycle-maniac,” and a hip-hop artist who sings about sustainability and climate action. The workshops focused on topics such as climate change communications, civic engagement, sustainable agriculture, biking, and more. The goal of the summit is not only to educate students about climate change, but also help students realize they can lead their schools, homes, and communities towards effective climate action. Giving students the tools to advocate for real change allows them to recognize the power of their own voices. This summit’s impact reached beyond those in attendance. One young student, who read about it in the Daily Hampshire Gazette, was inspired to speak out about the importance of climate action at all levels of government by writing her own letter-to-the-editor. This Youth Climate Summit expanded on last year’s one-day summit, allowing student teams to develop a Climate Action Plan for their school, including direct actions and proposals for addressing climate change drivers and impacts. The Climate Action Plans included a wide range of strategies such as increasing climate education at a younger age, removing bottled water from their school and installing water refill stations, organizing a zero waste week, and even installing an array of solar panels in the school’s parking lot. Thanks to support from the several local businesses, Northampton Education Foundation, and donations from the Community Foundation of Western Massachusetts (B & E Youth Futures Fund, Edwin P. & Wilbur O. Lepper Fund and Joan Walker Memorial Fund) the summit was able to give $500 to each group for implementation of their Climate Action Plans. In addition to the fun opportunity to connect with other climate-minded peers, students reported their participation increased their comfort levels with climate change as indicated by pre- and post-surveys. Mass Audubon hopes to expand this program by launching similar Summit’s across the state in 2019. This entry was posted in Climate on December 12, 2018 by Alexandra Vecchio. The blog was well written and provided information as to how MAS is partnering with local entities to provide students with opportunities to learn more about climate change and to make a positive impact on the issue of climate change.